Aotearoa New Zealand is a stunning country, no doubt. I fell in love with it during my first visit in 2009 / 10 and the love has not diminished since. I missed it so much that I returned for two visits in 2016 and then even moved here permanently a year later (ok, a certain man might have been a reason, too :-) ). Back then, as well as now, I take every opportunity I can grasp to explore all possible corners of the Land of the Long White Cloud. It seems like there is a never ending source of “WOW!” places in New Zealand. Back in 2009 I went on a tour that offered swimming with the dolphins. This was such an incredible experience I won’t ever forget. It was really hard to keep up with the dolphins, as they move extremely fast. In my excitement I often forgot to take a breath before diving with them, which obviously didn’t get me very far. Obviously, it’s a bit of an ethical question nowadays whether you want to swim with wild dolphins or not. What I can say is that the tour company made sure we knew not to touch the dolphins. I absolutely loved it and would recommend it to everyone. A bit more recently, Chris and I explored the Haruru Falls walk from Waitangi. It’s an easy 5km walk along the estuary to the Haruru Falls. 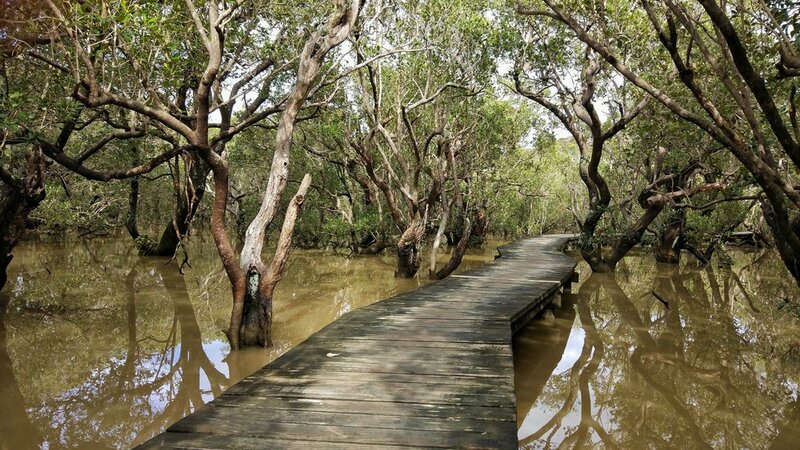 A part of the walk leads right through the mangroves on a wooden walkway. It was high tide and felt truly magical to walk through. We half expected a crocodile to swim up to us. From the falls it’s the same way to walk back. We originally wanted to walk one way and rent a kayak for the return, but the falls had too much water due to recent heavy rain and they wouldn’t let us rent one. But either way, it’s worth the walk. Auckland is my home town now and for obvious reasons the area where we go and explore the most. There are SO many more things to do in Auckland, and eating the most artistic ice cream ever. Obviously enjoying the view from the Sky Tower Auckland is a must do in New Zealand, and so is a ferry ride to picturesque Devonport. But my best place for you to visit in Auckland is not in the city. Rangitoto Island is a 20 minutes boat ride from the city centre. It’s the youngest of over 50 (dormant and extinct) volcanoes in Auckland. 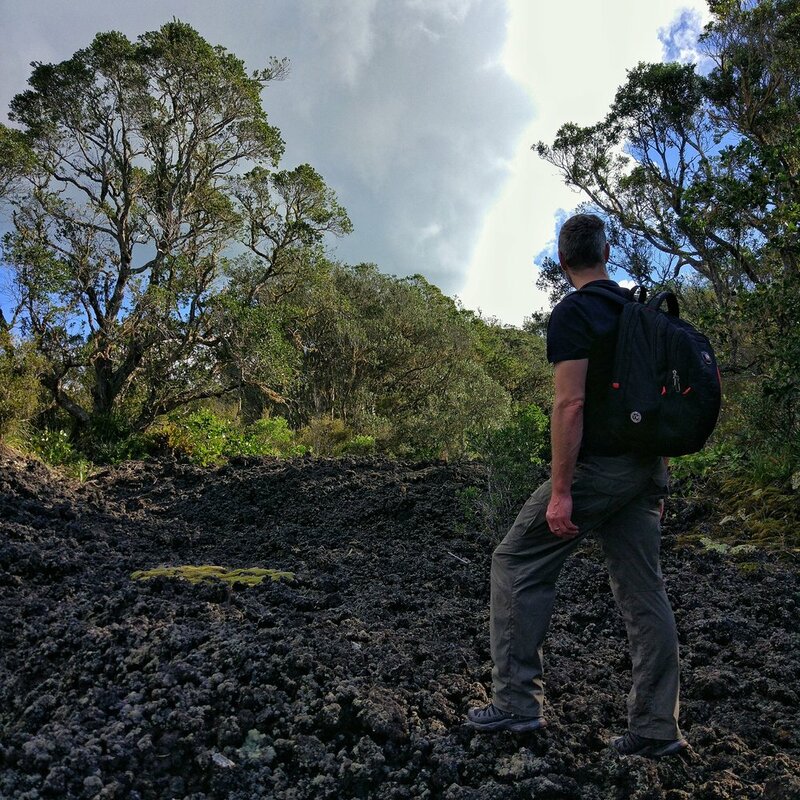 The walk through the lava fields to the summit and the lava caves are out of this world. And so is the view back to Auckland. Something that’s still on my Auckland bucket list is to go on the Rangitoto sunset kayaking tour. You kayak over to Rangitoto at 6-ish, walk up to the summit to watch the sunset and then kayak back to the city in the dark, only lit by a little light on each kayak. If someone’s done this tour before or is going to book it, let me know how it was!! Ok, technically, Waiheke Island still belongs to Auckland. The ferry to Waiheke only takes about 30 minutes. The main topic on the island, apart from some beautiful beaches, is the wine. There are over 25 boutique wineries on Waiheke, and most of them offer wine tastings as well as great food. Most of the wineries are accessible by a hop-on / hop-off bus, which makes it super convenient and easy to have a great day. Our favourite way to see the beaches and the wineries is to take the bus all the way to Onetangi Beach. We take a stroll along the beach to walk towards the first winery, Obsidian. From there, another 5 wineries are connected by the “wine trail”. This actually short walking trail leads through the vines and olive groves, but it took us the whole afternoon because we stopped for the occasional vino. Hot Water Beach and Cathedral Cove...those are the most famous places to visit in Coromandel. I’ve been to Cathedral Cove before it starred in Narnia and have dug my own pool on Hot Water Beach twice. They both are amazing places and very beautiful, I admit. But they have definitely become the victims of overtourism. There are still off the beaten path places in Coromandel, though. If you love a 360° view from the top of a mountain, do like we did on New Year’s Day 2018 and climb to the summit of the Pinnacles Coromandel. The ascent is steep and rocky over old stairs. The view is well worth is, though. If you want and book ahead, you can also stay for the night at the DOC hut. I heard the sunsets and sunrises on the summit are breath-taking. 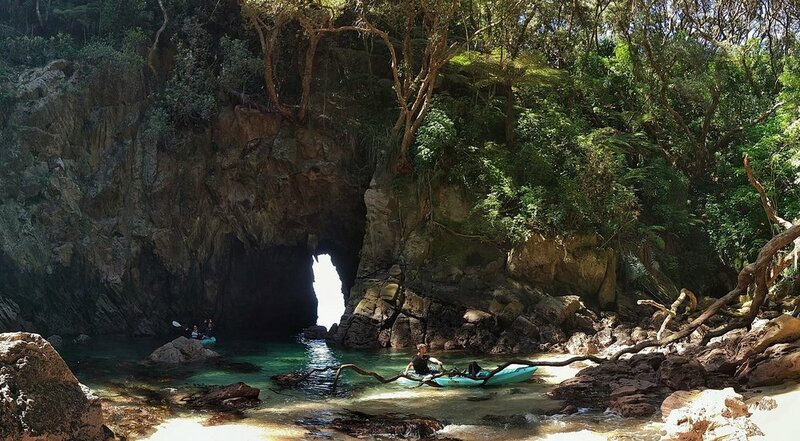 If beaches are more your thing, you have to visit Whenuakura Island, better known as Donut Island. This collapsed volcano just off the shores of Whangamata has been on my personal bucket list like, forever, and over Labour Day weekend, we finally went there! We hired a kayak and paddled over to the island. The entrance to the hidden cave made us feel like Robinson Crusoe and so did the little beach and water inside. It all felt unrealistically beautiful and I had to pinch myself a few times to make sure I’m not dreaming. You’ll have to go and see for yourself! Another island that was on my bucket list from the first time I saw a picture. An active marine volcano! And it’s accessible for everyone (who books a tour, that is)! The volcano lover in me jubilated. I had to see it for myself! The boat tour to White Island New Zealand starts in Whakatane (you can also fly by Helicopter from Tauranga or Rotorua if you have the cash). On the boat we were given a yellow helmet and a gas mask. We laughed and thought this must be to take more interesting pictures. I’m still not sure what we needed the helmet for, but boy did we need the the mask! The tour leads past bubbling lakes and mud and along vents that blow a huge amount of sulphur into the air. If you’re unlucky and the wind turns in your direction, you not only get a nose-full but it actually takes your breath away. I loved it! My only complaint was that the tour was over way too fast. Hands-down my favourite place in all of New Zealand! Yes, it’s a bit touristy in the town centre and some of the geothermal parks and Maori villages. And there’s a constant smell of sulphur in the air. But there is geothermal activity all around me. And nature. And so! many! lakes!! One of them, Lake Tarawera, even has its own hot water beach (yes, there are actually 4 hot water beaches on the North Island, not just the one). There are rivers with hot water. There’s a lot of food, too! You see, there’s really no reason for me (and you) not to love Rotorua. Definitely my number one of the best places to visit in New Zealand. I’d move to Rotorua in an instant. But I can’t (yet), so I just have to keep coming back for visits. There are way too many things to do in Rotorua to pick a favourite. Being a lover of geothermal Rotorua, I love visiting Kuirau Park, the free city park. Of the paid geothermal parks, my favourites are Waiotapu (for the colours, but touristy) and Waimangu Volcanic Valley (not crowded and I loved their lake cruise!). In the early 30s, a devastating earthquake destroyed most of Napier. 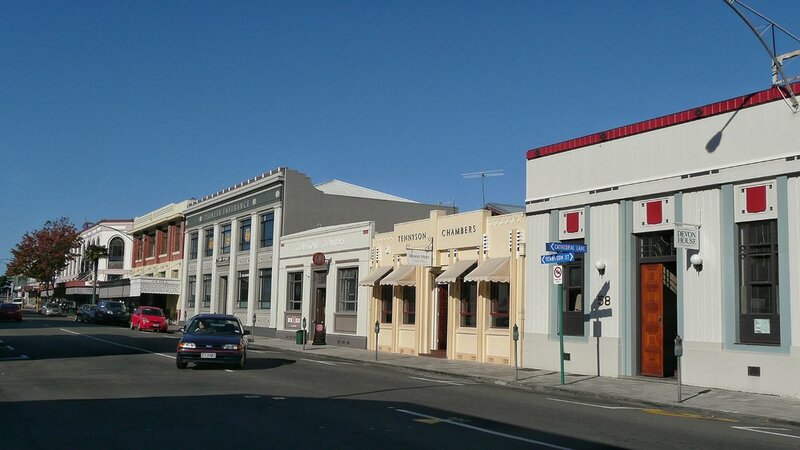 The city was rebuilt quickly and in the architectural style of the time and was from then on known as Art Deco Napier. The Art Deco houses and the wine that is grown in the region eventually put Napier on the tourist radar. I visited Napier in 2010 and found the town very laid-back and relaxed and of course loved the wine tour we were on. There were heaps of bonfires on the rocky beach which gave it a slightly romantic touch. Taupo has transformed into a lovely city with a charming waterfront and loads of Restaurants. The place is dominated by Lake Taupo, the biggest lake in New Zealand. And it’s not just any lake, it’s really the caldera of a giant volcano that is still active today. The water incredibly clear blue and on sunny days the sun reflects from the lake ground. But for once it’s nothing volcanic that makes Taupo a highlight. The area around Taupo (and Rotorua) is great for mountain biking. We recently biked a part of the Great Lake Trail, the Waihaha Section. This 30km one way ride is a lower Grade 3 trail, which means it’s great for intermediate riders (I died a few times from about half way point on, but that’s a different story). We got picked up by a shuttle bus in Kinloch that dropped us at the beginning of the trail. The Great Lakes trail boasts spectacular views over a valley and later the lake and is really well maintained. It ends on a small beach where the water taxi picked us up (needs to be pre-booked) and brought us back to Kinloch. Another place that’s in my personal Top 5. And another one that’s volcanic. Tongariro National Park is home to New Zealand’s most famous day hike, Tongariro Crossing. Apart from the fact that a sh..load of people do the crossing every day, it really is worth doing. So far I’ve done it twice and loved both times. The hike is 20 km long and takes about 6 hours from start to finish. Some of the highlights along the hike are Mt. Ngauruhoe, Red Crater and the Emerald Lakes. But Tongariro National Park isn’t just the crossing. There are two big ski fields that are open in Winter, which for me as Swiss is great, of course. But we also loved the Old Coach Road bike trail. It combines some of New Zealand’s history with a beautiful 15 km bike trail through the national park (Grade 2). Wellington is often overlooked by travellers. It’s just a quick pitstop before boarding the ferry from the North to the South Island. It’s a pity because there are so many things to do in Wellington, and so many of them are free! My highlights was the Te Papa Museum, where we spent the whole rainy day, exploring. The national museum teaches a lot about New Zealand’s history, but also hosts international and interactive exhibitions. Even though I’m not the biggest Lord of the Rings fan, I enjoyed visiting the Weta Workshop, Peter Jackson’s workshop where many legendary movies got created. Apart from the Weta Cave, where you get to pose with trolls and Gollum, it’s really worth taking the workshop tour. Although it’s a bit misleading as you don’t get to go into actual workshop, you get to see and touch some props and costumes. And since recently, you can also take part in a workshop and learn how to make fake blood. If you love dress-ups like me, this is perfect for you! Even though I grew up in Switzerland, I had to wait till I got to New Zealand to hike on a Glacier! And it was amazing! Our guide explained to us some geographical details and about the tectonic plates in New Zealand and then we were off onto the ice. We walked behind the guide because every step to the wrong side could mean falling into crevasse and potentially die. The guide led us through the ice and even into ice caves. Now, this all happened back in 2010, when it was still possible to get onto the glacier from the glacier tongue. This is not possible anymore since the glacier retracted too much that it became dangerous. But luckily it’s still possible to get onto the glacier by helicopter. And there are plans for a future cable car that brings tourists to the glacier so everyone can see it again. Wanaka lies in the middle of this stunning Lord of the Rings landscape. It’s a quiet town with the famous Wanaka Tree in the water. We walked up Mount Iron which presented a spectacular view over the whole Wanaka area and the Southern Alps. What we also really enjoyed was Puzzling World. We went there more as a laugh but the optical illusions and sensory experiences caught us by surprise and we had a blast in there, watching water seemingly flowing uphills and playing with perspectives. Of course, Queenstown can’t be missing in a “best places in New Zealand” article. The so-called Adventure Capital of the World is...exactly that. The world’s first commercial bungy site originates in Queenstown and since then, many more crazy and adventurous activities followed. Queenstown is also one of the few places in New Zealand with an active nightlife. Like in Rotorua, there are so many things to do in Queenstown that it’s hard to choose a favourite. We enjoyed taking the Skyline Gondola up the mountain to take in the view over the lake and the Remarkables. We would’ve loved to try out the luge, but unfortunately it was closed for maintainance. There’s hardly anyone who’s been to the South Island, but hasn’t visited Milford Sound. We took the Milford Sound Tour from Queenstown as a day trip. The day is long but absolutely worth it and if you plan to leave from Queenstown and come back on the same day, I suggest you too take a tour instead of driving. That way everyone gets to enjoy the scenery. We left very early in the morning. Which was ok, since we could sleep on the bus. The first bit to Te Anau wasn’t very spectacular, but this soon changed on the Milford Road. We drove through a valley and stopped on the Mirror Lakes, as well as in front of Homer Tunnel, where we saw the cheeky Kea birds picking rubber off other people’s car wipers. Milford Sound cruise was stunning, too! We felt tiny next to the giant mountains that rose out of the water of the fjord. There are countless waterfalls. They were only small when we visited as it hasn’t been raining in a while (it was fall), but not any less impressive. On the way back we had the chance to upgrade to a flight back to Queenstown. My friend took the chance and loved every minute of it while I watched my budget and drove back by bus. Dunedin is together with Napier the city with the most special architecture in New Zealand. Where most cities and towns look kind of similar, Dunedin stands out. When we strolled around the Otago University, one of the most famous unis in New Zealand, we felt like Harry Potter must be coming around the corner any time now. Also the train station, the churches and even the hostel we stayed in (funny enough also called Hogwartz, almost like in the movies) had the same stunning architecture. Thanks to the many students, Dunedin is a young city with a lively nightlife. It can be mainly found in the Octagon. And of course we couldn’t miss out on walking up Baldwin Street, Dunedin’s steepest street. We even managed to drive all the way up which not all cars managed to do. Apart from Queenstown, Twizel-Tekapo-Mt Cook area is often used as a photo subject to showcase the “real New Zealand” to the world. Obviously, it’s only one of New Zealand’s many faces, albeit an extremely picturesque one. Mount Cook lies at the end of a wonderful glacier valley that reminds a lot of Lord of the Rings. From the parking at the end of the road are boardwalks that lead over delicate nature towards the end of the glacier and the glacier lake. You’ve probably seen pictures of the Church of the Good Shepherd before. 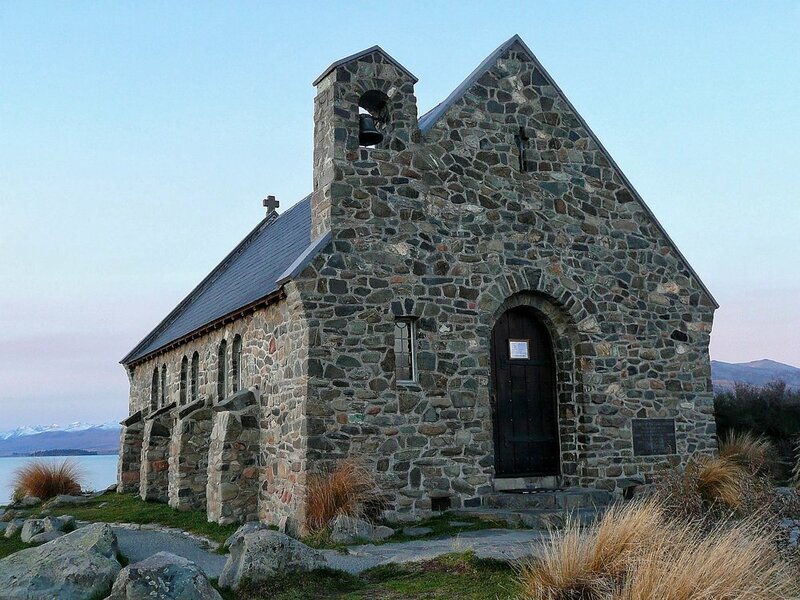 The little stone chapel overlooking Lake Tekapo is hard to be photographed without people in the picture nowadays, but it’s still very serene. Christchurch New Zealand has been through a lot in the past years. Several severe earthquakes ruined a lot of the city’s famous buildings like the Christ Church Cathedral. To us outsiders, Christchurch still looks more like a ruin. But they are slowly getting back on their feet now, with buildings being re-built and streets opened. The citizens built temporary cafes and shopping malls out of containers, which give a bit of a hipster, colourful look. This little town is most famous for its Kaikoura whale watching. The waters around Kaikoura are deep close to the shore, which makes it easier for the whales to come closer and the boats don’t need to get too far out on the ocean. When I was there it was unfortunately pouring down with rain and the tour got cancelled. But instead I visited the seal colony on Ohau Point. It’s easily reached from the parking lot and definitely a must-do in Kaikoura. The colony is quite big and the seals don’t mind at all to be your photo model. Just make sure you don’t get too close to them or stand between them and the water. Mount Egmont is now known as Mount Taranaki and was even granted the same legal rights as a person, as the local iwi (Maori tribes) view the mountain as their whanau (family). For the rest of us, Mount Taranaki is a volcano right out of the textbooks. A perfect cone and snow capped mountain top, surrounded by surf beaches. A small lake in the foreground and Taranaki mirroring in it makes the picture-perfect shot. When I finally make it there, I’d like to drive around the volcano on the Surf Highway (yup, that’s the official name) and try and climb it as far as we’ll be able to get. I imagine the view from the top must be amazing. I could still kick myself for not visiting Abel Tasman National when we drove past Nelson on the way down to the West Coast. Abel Tasman, together with Nelson, has everything Chris and I love: Hiking, kayaking, biking, wine and beer. Once we make it to Nelson, we’ll rent a kayak on freedom hire (without a tour) and stay in the park for 2 or 3 nights, exploring the park paddling and walking. The sheltered bays are perfect for kayaking I imagine the campsites on the beach must be stunning. I’ll let you know when I found out. Travelling New Zealand with kids? Here are 10 things you mustn’t miss when you travel New Zealand with kids. Just add them to my suggested places above and make the little ones happy. There you go, those were my 20 best places in New Zealand. Although, as we’re discovering more places this list keeps expanding. Because, to be realistic, New Zealand is just full of amazing and awesome places, many of them away from the beaten path. What are your favourite places in New Zealand? Have I missed a cool activity or an awesome place? Then let me know in the comments below! If you found my article helpful, please feel free to share it with anyone who loves New Zealand by clicking the share link at the bottom of this page. Loved what you read? Pin it to Pinterest!